Thanks for the write up! I had the exact same issues with my Flip–minus the camping trip. I also didn’t think about deleting the trash. With a simple Google search, your article saved me hours of headache! I also agree with all major points made about Flip in the end of your article. Hopefully, someone has taken notice. just wanted to say thank you! i had the exact same issue, except i was in canada visiting my lady. went to rock the bells (hip hop festival) in toronto and when i pulled out the flip it says 1:34. couldnt believe it! i thought it was done for. now im back in vegas, in need of it tonight, and find your write up. now its back to 60. thanks again. TJ, Shake: Thanks for the comments, and glad I could help. 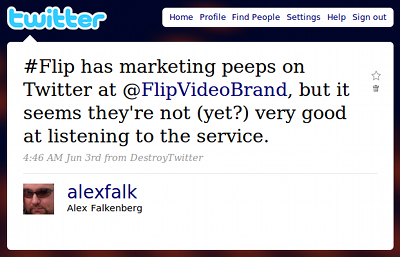 And TJ, I too hope the Flip folks are already considering the issues/suggestions I mentioned. are you kidding me?? i can’t believe it was that easy. i had been having the same issue with my mino, googled ‘HD flip camera support” and your post came up third. i didn’t even have to contact the flip people:) your article was insightful and easy for me to understand (i’m not so computer savvy). i am about to leave for bryce canyon with 60 minutes. glad you were here to provide support! Just had this exact issue with my Mino. Very frustrating to have “mystery” files taking up space. Thanks for posting this! Dave: Happy it helped, and you’re welcome, anytime. Thank God for you! I was in a panic working with my new Flip today, which allowed me 11 minutes to shoot when I had to do an hour-long interview. Fortunately, I emptied the trash and all was well. Much gratitude. FlipCam Novice: Glad we could help. Hope your interview went well! Not the same issue…my screen froze during recording and I couldn’t shut the unit off, either. But I tried out the unfolded staple into the small hole and it did, actually, reset the unit. Turned it off. When I got back on it, the video was working fine. Thanks. Thank you so VERY, VERY much from me, too. So glad your story and solutions rank among the top on Google!!! For some time my FLIP MINO had been hanging at only 48 min and I hadn’t taken time to research the challenge. Yesterday after recording several ONION PEELING, plus videos – http://www.youtube.com/user/InspirationalSheila#play/uploads – I was down to 16 minutes. This was now becoming a crisis situation! and I expected a lengthy time to find the fix. On finding your post, I tried the reset button and the 10-second hold. Neither worked. And, I was surprised to see that when I attached my FLIP to my computer files were still showing in the DCIM folder. I trashed them and EMPTIED TRASH while FLIP was still connected. Lo and behold, I have 60 minutes again!!!!! Again, I so appreciate your take the time to tell your story. Thanks for much time saved. I had a similar problem on a Mac/OSX. I dropped to terminal, went to where flip video device was mounted (in my case: cd /Volume/FLIPVIDEO), looked for various .dot files that wouldn’t show up by default in Finder (ls -al) and deleted the trash directory, .Trashes (rm -rf .Trashses). All better now. You rock. One of the strong selling points of the FLIP was its ease of use. It is dirt simple to operate, but this really seems like a killer design bug, in that the same people who want a simple interface are usually not going hunting for these stranded files. With a camera in every cell phone as well as the new ipods, these dedicated use devices will probably not be around for much longer unless they can offer some quality/feature advantages, do reasonable testing before release and respond quickly to user bug reports and helpdesk issues. @Jack Welch: Really glad we could help you, and I agree with everything you mention in your second paragraph. Thanks for taking the time to visit us and contribute to the comments/thread. I can’t believe that I can’t Google a solution. I’m not real happy with this camcorder. All it takes to hose it is to delete the videos? Boo! Again thanks Alex! Thought I had a bad Flip. @Justin: Glad you got it working. 🙂 We thought the same when it happened to us, too. @David: Sorry to hear that. 🙁 There’s one other possibility, which is corrupted data on your Flip’s internal drive. This happened to us once since we wrote the initial article above, but we’ve not had a chance to document it yet. Running ‘chkdsk /f X:’ (where X is your Mino’s assigned drive letter) from Windows should help you. It will repair the damage and likely save a few files you can delete; after that you should be able to get all your space back. fsck under Linux is another option, but has more error potential, imo, unless you know what you’re doing. As I’ve said before, PureDigital needs to add a hard-reset option–built into the unit–to basically reset the data store and recover full time; it would be really helpful. Same issue with my Ultra HD. When I hit the unmount volume button on ubunutu it flashed up with a box asking if I wangted to empty the trash folder. I assumed it meant the systyem one, not the Flip one so I said no. Can’t find those folders on a Windows machine so I’ll try again with Ubuntu and see if I can find them. If I do, thanks for putting up this page. @Skemps: Hope you got it worked out. thanks for the info, but it did not work for me. i have a 1st gen flip with 60 min hard drive, running xp, and i emptied the trash, but it did not work. also could not find the reset button in the tripod mount. is this only on the HD model? @edward: I’m not 100% on this, but I want to say I’ve read the reset hole was a later feature not present in 1st-gen units. The earlier comment I left for David above (direct link here) regarding using CHKDSK might still help you purge corrupted data and recover your recording time. Good luck, and thanks for stopping by/commenting. @Eric: Unfortunately, I don’t think there’s a sure-fire procedure that covers “not making this problem happen again.” Deleting items via the camera’s own interface or via the FlipShare software should, in theory, be error-proof. Quite a lot of evidence out there that it’s not, however. I’ve not yet given any 2nd-gen Minos/Ultras/etc a shot yet, but I’m guessing there hasn’t been much in the way of improvements as far as the issues you describe are concerned. My impression is that PureDigital is quite satisfied if the unit lasts the duration of the (frankly pathetic, non-confidence-inspiring) 90-day warranty they provide. Exactly the same problem with my Mino hd. and 2- she has deleted the files not knowing the Flip’s tricky system. Flip should have easier solution to an obviously common problem. anybody with a solution to my woes? I formated the Mino, and it miraculously recovered its lost memory with no problem. why hasn’t anyone thought of that, when one lacks the other alternatives? Why have they not fixed that stupid problem for a supposedly easy camera to use? thank you anyway to all as you were informative. my decision is not to buy or recommend the Mino to anyone, until I receive a free new model! @papavert: Glad you got it working again. As for straight formatting the unit, when I was researching this I found people had issues after doing a format as you describe, even rendering the device (temporarily?) useless in some cases.. It was never clear to me which units could or could not be safely formatted, so I opted not to try or recommend it. I’m happy to hear it worked out for you, though. @wringz: I just stumbled across that video recently myself. As alluded to in my reply to papavert, I’d be careful recommending that solution to everyone, but since the folks at Flip are only confident enough to provide a 90-day warranty on their hardware, sometimes you have to just go for it. You’re certainly welcome for whatever help we were able to provide. I just wanted to thank you for the assistance. I had this issue because I manually deleted video files from my macbook. For the life of me, I couldn’t figure out how the the camera’s memory could be deteriorating so quickly, but you solved it. (I ultimately had to download a special file explorer so that I could see the .Trashes directory.) Thanks again!! I have a Mac, and don’t understand how to do the fix. The fix of “emptying the trash” does not work for me. I cannot find the trashes directory, nor can I find anything in the DCIM directory to delete. Suggestions? To undo this change and re-hide your dot files (eg .Trashes) and other system folders, re-enter this command changing the YES to NO. After each time, you’ll need to restart the Finder so the change takes effect. One way: hold down the Option key, then click and hold on the Finder icon in the Dock. When the contextual menu appears, select Relaunch and the Finder will restart. Hope this helps everyone using OSX, and my apologies for not providing such info sooner; we use OSX here, but not with the Flip camera, so we never thought to include it. I, along with everyone else, had the same problem, and am grateful to have found you through Google. You saved me a lot of headache! I also want to send my thanks. Couldn’t for the life of me figure out why I only had 31 minutes left on my Flip mino when I had deleted all the videos on it. Interestingly enough, I am a new Mac user and this never happened to my Flip mino when I was on a PC. Some more words of advice: I tried everything you suggested and the time still didn’t go back to 60 minutes. So then I realized that I had to actually EMPTY THE TRASH on my Mac…. go figure!!!! Then my time went back up to 56 minutes. Still not 60 minutes. Looking again at the folders on my mino, I saw this MUSIC folder….. WHAT???? I opened it up and found a bunch of songs…. where the heck did these come from???? I recognized them as my music, but still…. how did they get on my Flip Mino? 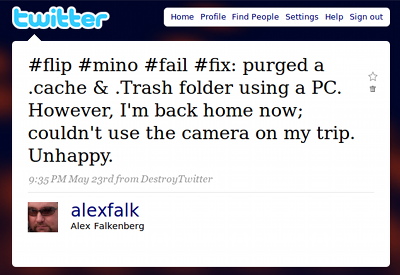 I deleted them and then found another folder on the Flip Mino called “FOUND.100”. I deleted these files (which end in .chk) and now I’m up to 58 minutes. There are probably more things hiding in the Flip Mino somewhere but I’m pretty happy with 58 minutes of recording time. Thank you so much!!! –	When you hear the bell and a window pops up that says “Conversion complete”, click “Okay”. The .mp4 file will show up in the same 100VIDEO folder you found the original .avi file in. Drag the .mp4 file onto your desktop. –	Now open up iMovie. –	Go to File, Import, Movies, Desktop, click on your .mp4 file and then “Import”. –	VOILA! Your .mp4 should be in your iMovie project! Sylvia: Thanks for finding us, and glad you’re up and running. Also a big thanks for the iSquint pointer. I don’t use my Mino on a Mac at all, so I’m not really in a great position to offer much workflow or troubleshooting advice. iSquint does look to be free, and digging around, I see that it’s used pretty successfully for just the kind of thing you’re doing with it. I’d say you got some good advice from the Apple Genius. The only other thing I have to wonder about is whether all or part of that process could be scripted/automated. Maybe another question to pose to a Genius next time you’re in a store? Unless the disk in the Mino is damaged in some way, you really should be able to get all of the space back. Maybe there are other files still hanging out there somewhere. Make sure you’re also finding any loose invisible “dot files” (they start with a period) that may be hanging out. See the previous comment left for Winston and michael on showing those hidden files. The MacWorld article linked therein is a great resource for more info, too. Good luck (and feel free to write again if you need more assistance)! on a mac, i solved this problem by pulling all the files from the flip drive to my hard drive, and then i opened disk utility and formatted it. then i copied the files back in, and the camera works now. @bn: I’ve read about others doing that; glad it worked for you. I’ve seen postings around online from others who tried the same thing and weren’t successful for whatever reason. Thanks for commenting and sharing your solution. formatting the mino will clear the recording time. Flip says that he mino can not be formatted, but it can. @Jason: Thanks for the comment and suggestion. As just mentioned to @bn above, formatting has apparently worked for some people, but resulted in bricked/dead units for others. For me, it seems too risky to be standard operating procedure for hard-resetting a unit. I personally don’t trust it, nor would I consider it a best practice based on what I’ve read/experienced so far. Note the sections referring to a nonstandard file allocation unit size; this may be what has bitten others who have been unsuccessful reformatting, I don’t know. I’m still not all that convinced Flip/Pure Digital/Cisco fully understands their own hardware–or the end users of their products. Everyone would benefit from FlipCo implementing a proper hard-reset method any average consumer could easily invoke–ideally without requiring a PC of any kind… and maybe extend their confidence-killing 90-day warranty while they’re at it, too. @Nir: You’re welcome; glad we could help. I was going crazy and there you were. I couldn’t find the fix on ubuntu’s forum, my box is an XP orphan that I replaced with Ubuntu 10.04 which I love but still need to learn a few things. My windoze logic gave me tunnel vision. Thanks for posting the fix. And hey FLIP, where’s the Linux package???? ?